"Snow falls on the just and unjust alike in Hans Petter Moland’s In Order of Disappearance. The white stuff has always been a great symbol of the nature’s indifference to man – a blanket that erases everything under static, frozen purity. To battle against snow is like ordering the oncoming tide to retreat. 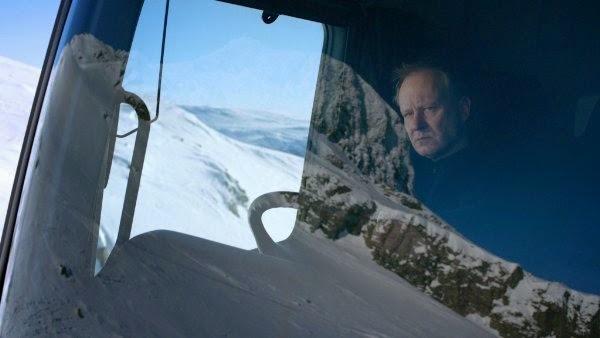 In Order of Disappearance finds its Canute in Nils Dickman (Stellan Skarsgård). He lives in a remote, snowblasted town in the backwaters of Norway, devoting his life to the vital task of clearing the roads of snow. His tool for this is a gigantic industrial plough, a fearsome mechanical beast with tyres wreathed in chains and an armored wedge bolted to the front. Nils is hugely respected, we meet him just as he receives ‘The Citizen of Year Award,’ and local politicians are trying to convince him to stand as a political representative. Life is good. Chilly, but good." Read the rest at We Got This Covered.